Seattle – home of notable Starbucks, Nordstrom, and the awe-inspiring Costco – is also the home of my research début at the 2013 SRCD Biennial Meeting. The UHP/SURE award partially funded my travel expenses for this three-day conference with professionals in the field of child development research. With the help of two of my professors in the Speech and Hearing Science Department, Dr. Francys Subiaul and Dr. Cynthia Core, I submitted my Independent Study research as a poster presentation for the conference and was fortunate enough to be selected. SRCD, the Society for Research in Child Development, encompasses a multitude of fields ranging from schooling to developmental disabilities and biological processes to moral development. 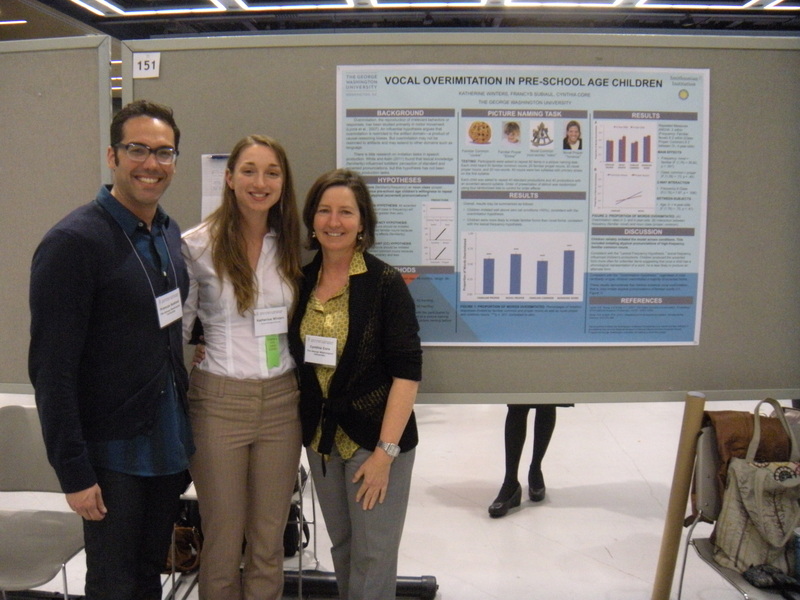 My submission, “Vocal (Over-) Imitation in Preschool Age Children: Insights into Phonological Knowledge and Speech Production” focused on child language development. This research, which was also funded by the UHP/SURE award, looked at which factors influenced a child’s willingness to adopt a new phonological form. Essentially, it questioned whether children would imitate a novel accent for both unfamiliar and familiar words. Results showed that children did adopt the novel accent and emphasized the second syllable of two-syllable nouns, even for familiar words such as cookie. Presenting in an environment with so many experts in child development was slightly intimidating and unbelievably challenging. Some researchers were completely unfamiliar with language development while others studied overimitation in respect to objects instead of speech, requiring me to tweak my presentation based on my audience. What was most exciting about my presentation was the opportunity to talk about my project with other inquisitive, research-minded individuals who gave me invaluable feedback for alternate hypotheses and follow-up studies. I was also able to listen to countless lectures on topics related to my field such as bilingual language development or unrelated to anything I’ve ever studied such as social media’s effect on children’s social skills and bonding. I am extremely thankful for the support from the UHP and the SPHR department that has allowed me to pursue this project and presentation as an undergraduate. Stay tuned for research updates, possible publications, and more in grad school!